Social media addiction research shows alarming statistics during work. 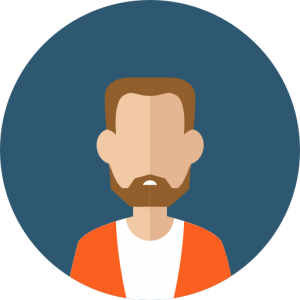 Misuse of something can steer to several kinds of addiction; such as drinking, gambling, and dating. Addiction is possible in the sphere of life, even on work jobs, obsession with a relation etc. Similarly, addiction to social media is ever rising. 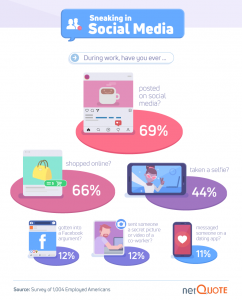 Surprisingly, a survey showcased that a normal person uses social media around 2 hours every day. Most of the people use it more than the two hours, scrolling down on Facebook and Instagram feed. Most of the people enjoy spending time online with other people rather than meeting them in person. Maybe our digital lives weigh more than the physical one. It is pertinent to know how the digital world is affecting our daily lives? Does all this digital involvement affect our lives? And, how does it influence the working life of Americans? Have we ever measured the time we scroll our phones and digital devices while we are on work? To know the reality, NetQuote conducted a survey, which included more than 1000 people who are employed in various departments in the United States and are the users of social media. A research showcases, average worker work waste four to five hours on checking their email. Certainly, every hour at work is not that productive. However, there are many who after doing a particular work open random tabs of social networks and scroll through them. This is the only constant thing in today’s jobs. A study suggests in ever three people two admitted posting on social media while working. In spite of the fact, your boss does not appreciate posting stuff on social media and they can monitor what you are up to online on an office’s network still many do this. Not only this but, but many accepted they do online shopping while sitting on a desk. This type of distraction immensely affects the prescribed job that one does at the office. In every five, two people took selfies at work and posted them on various digital social platforms. In addition, more than one in every 10 people asserted that they indulged in a debate on random posts on social media. Besides, many sent secret pictures and videos of their colleagues and texted others on certain dating apps. To our utter dismay, more than Ninety-five percent people confessed to using social networking websites for their personal use at work; most of them do not feel wrong about it. According to our study, most of the business days get wasted in personal use of digital media. Among many social media platforms, YouTube tops the list and account for most of the loss of a corporation. People use YouTube for listening to videos and for watching the videos of their interests, mesmerizing and sensational. 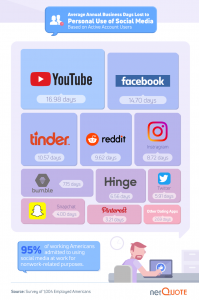 After YouTube Facebook is on the second number which wastes on average 15 days of an employee. People who use Facebook spend their time on news feed liking and commenting on different random posts. Many play quizzes and watch videos on Facebook. Famous applications like Snapchat, Instagram, Pinterest and Tinder waste ample time of an employee almost more than 10 days of a month. Workers are inclined to stalk or find their matches on various dating apps such as tinder. Many consider Posting on Instagram for getting more likes and comments as a part of their job. It is alarming that many do not consider spending time on social media as ill. Although the digital world and marketing have become part of the job, giving the digital world too much time affects the job. Reportedly, people who work in real estate are more prone to spend their time on social media at work. On average these people spend around 9 hours every week. This time is wasted on Instagram, Snapchat, Facebook and YouTube. 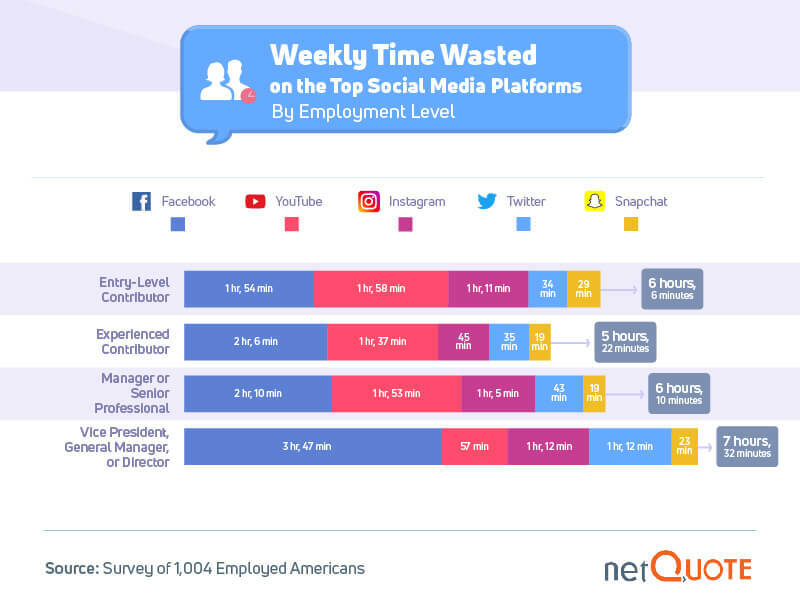 People who work in technology-related companies waste around 3 hours per week on Facebook and other social media platforms. 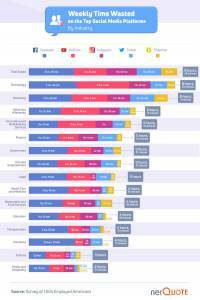 Moreover, they spend more than three hours on YouTube higher than any other firm workers. Check out social media waste of time statistics below. The exception is only those people who work at hospitality and other scientific companies. Their usage of social media is much lower than the others. industries for social media use in the workplace, with each averaging over 8 hours per week. Not only employees but Managers too! 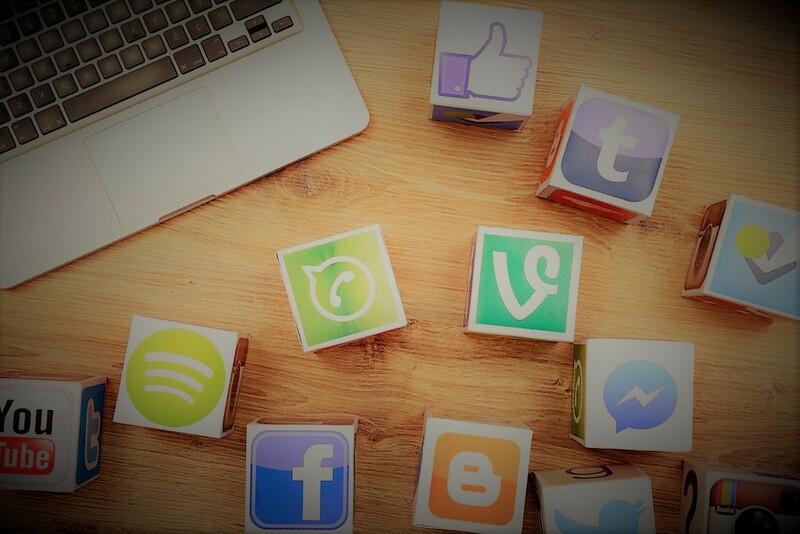 The problem of wasting time on social media not only exist among workers but the rate is much higher in the Managers, CEOs Vice presidents, and directors. They have confessed to spending much more time in the digital world. As per the poll results, more than 90 percent felt irked while using Facebook or other digital platforms on work. The other five percent asserted that they have been called for their use of social media, and five percent never used digital media on work for personal use. As a whole, the use of social media while working has been engraved in our minds. People have become addicted to the use of the digital world. Workers have confessed to using Facebook, Snaptchat, YouTube, Instagram and many other dating websites while on work. Majority of the people were never told to stop wasting their time with their boss. However, any addiction is bad, less use of social media make you happier. You should check out these 10 amazing ways of staying motivated during work and follow these.